History’s about to be rewritten by two guys who can’t even spell. Los Angeles, CA – Excellent! 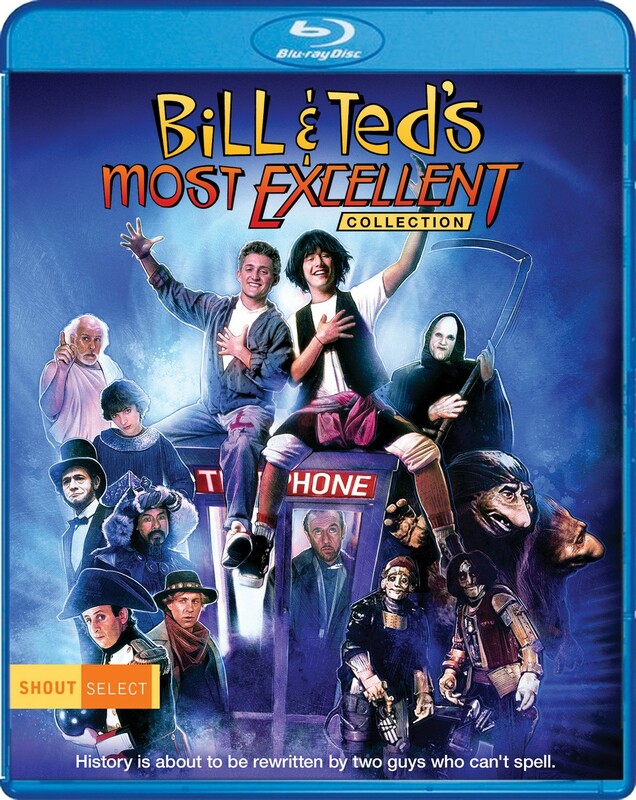 History’s favorite time traveling duo land on September 20, 2016 in a deluxe Blu-ray box set from Shout! 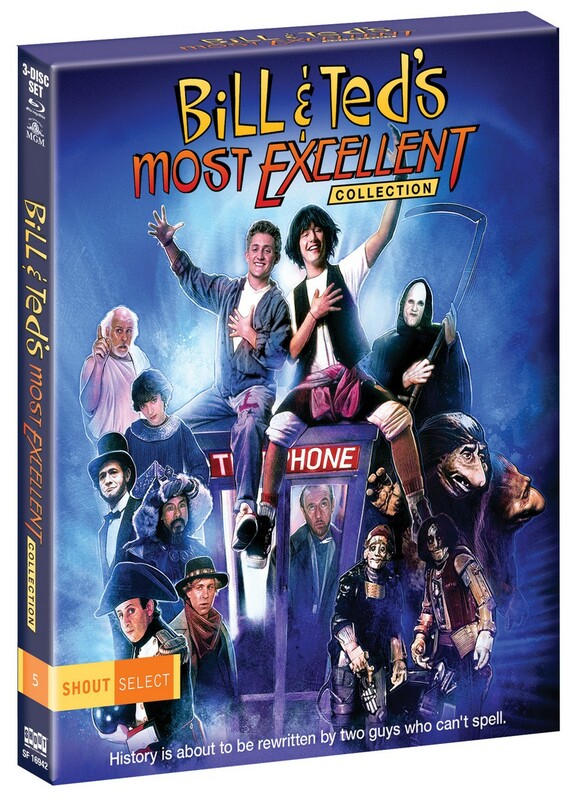 Factory titled Bill & Ted’s Most Excellent Collection. The bodacious set includes Bill & Ted’s Excellent Adventure, the Blu-ray debut of the sequel Bogus Journey, and is fully loaded with an entire disc of bonus features, including new interviews and commentary, deluxe packaging, a “Wyld Stallyns” branded guitar pick, vinyl stickers for both films, and previously released extras including The Original Bill & Ted, The Most Triumphant Making-Of, Air Guitar Tutorial, The Linguistic Stylings of B&T, From Scribble to Script, The Hysterical Personages of B&T, and radio spots. 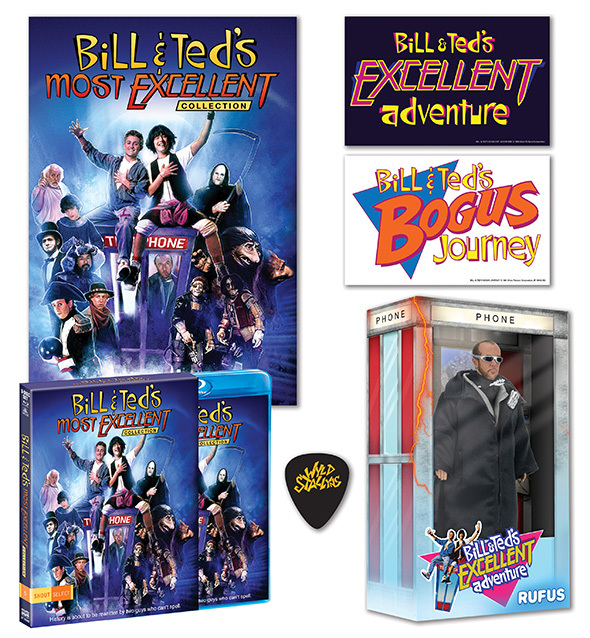 Bill & Ted’s Most Excellent Collection is part of Shout! Factory’s new home entertainment series Shout Select, which shines a light on films that deserve a spot on your shelf. Debuting this August, Shout Select boasts an exciting slate of fan-favorite releases making their Blu-ray debuts. Titles include the pulp sci-fi rom-com classic The Adventures of Buckaroo Banzai Across The 8th Dimension, John Carpenter’s Emmy Award® -nominated biopic Elvis, the brilliant action-comedy Midnight Run, and the rowdy action-thriller Road House. Each title will be presented in anamorphic widescreen, and when possible will be released as a Collector’s Edition, with new bonus content, archival materials, collectible cover artwork, and more. NECA is the leading designer, marketer, and worldwide distributor of licensed entertainment consumer goods based on some of America’s most established and beloved properties, providing products across all consumer categories. Specializing in the 12+ licensed movie, video game, comic book, and traditional literary markets, NECA has over 60 licenses from major media partners for properties including Alien, Godzilla, Star Trek, Teenage Mutant Ninja Turtles, A Christmas Story, “Weird Al” Yankovic, and numerous other major properties from Marvel and DC Comics, major video game properties, as well as professional and collegiate sports. The NECA group of companies includes game developer and publisher WizKids, urban vinyl icon Kidrobot, retail chains Hastings and MovieStop, and full-service distributor SP Images. NECA is part owner of the Muhammad Ali estate and a partner of the Marilyn Monroe estate, and holds a majority ownership to Elvis Presley Enterprises, Inc., granting NECA the property ownership and management rights to Graceland, Elvis Presley’s home in Memphis, Tennessee, in partnership with ABG and the Presley family.